These precious and cute Pom Pom linen napkins are perfect for any modern and boho chic inspired dining room or kitchen. I absolutely love them! 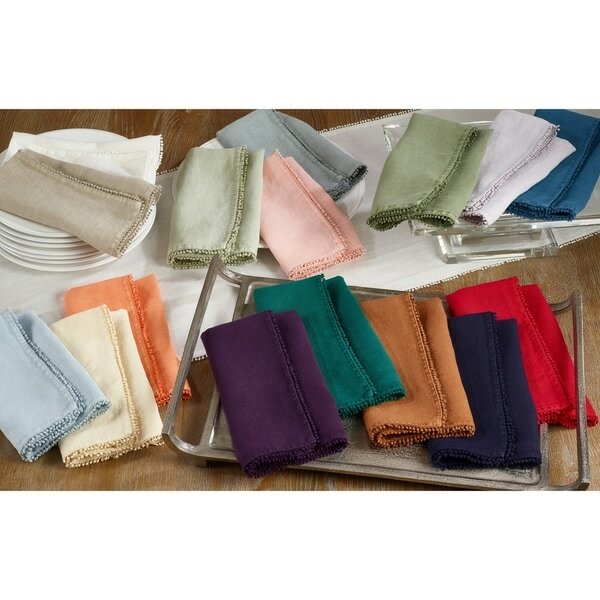 Aside from food, nothing says dinner party more than linen napkins. They bring style to any affair, especially these pom pom-patterned babies. They're cute, yet elegant. Made of 100% linen, these dinner napkins are square-shaped and come in a set of four, in a deep, rich, bold color that stands out. Cloth napkins come in handy for wiping your mouth and protecting your lap. Fabric napkins are easy to wash, and you can fold them and store them away for your next shindig. Really high quality. Soft linen with perfect, tiny pom-pom trim. They wash well and add nice texture to the table. The color is a wonderful soft grey-blue. Love the fabric! Exactly what I wanted!